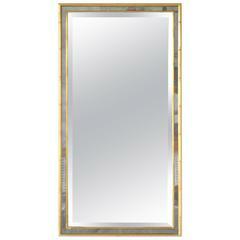 French giltwood faux bamboo mirror. 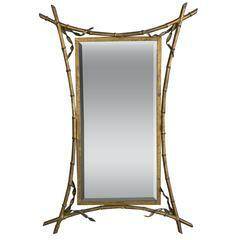 Chinese Chippendale Style Faux Bamboo Mirror. Frame is resin with a gold finish. 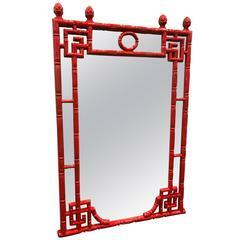 Chinese Chippendale style red lacquered faux bamboo mirror. The frame is of a hard plastic material. 1950s, Italian giltwood mirror with decorative, carved wood frame. Gold leaf. 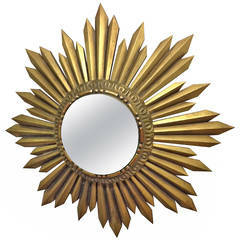 Gold giltwood framed sunburst mirror. The mirror protrudes outward from the wall. Hollywood Regency style. Overall measures: 22.5&quot; in diameter. Italian carved silver giltwood faux bamboo wall mirror. Its tall stature makes it a perfect piece for an entryway, bathroom, bedroom, or any room in your home! A white painted faux bamboo mirror with metal surround, American, circa 1970, 56 ins high by 30 ins wide. Small mirror with wooden faux bamboo surround, French, circa 1940. Measure: 30.5 ins. high, 22.5 ins. wide; mirror 23 ins. high, 14.5 ins. wide.